as summer slides away and culminates in my artist in residency exhibition – it opens on the 15t hSeptember… it’s going to now take me teeny bit it longer to put together the finishing touches… as at the start of the week I managed to slip slide away and do a cartwheel down a flight of stairs. No mean feat when you are 39 and three quarters (sic – for the sake of the new reader I decided a while back to stop aging before I got to 40 – very sensible advice in my opinion feel free to magpie). No broken bones fortunately just bruised and battered… I feel extremely lucky….I think the crystals I bought in Totnes over the summer must be doing their thing. Did you know crystals, according to my 10 year old, keep you self-centred??? Hmmm…he’s possibly right! Fortunately, until said fall from grace, I had been very busy getting things finished for final assembly of my work at the theatre next week so my enforced hiatus shouldn’t be too much of a setback…. so I will pop pills like there’s no tomorrow for a couple of days and then get back on track…time and tide and all that jazz…and pull everything together at the weekend. It was quite tricky deciding which route to go for the final installation. As you might imagine the theatre has provided me with a plethora of stimuli……. I spent most of August sorting out what to do and what to use, what to take forward and what to shelve. The end result is my take on a celebration of ‘Festival 18’. My main aim was tell a story through my art work and reflect the theatre, its’ environment and its’ people now – as well as acknowledging its’ wealth of history. You can let me know if I’ve succeeded!!! It’s quite tricky working to produce something that lives up to other people’s expectations but I am hoping my artistic response will please….however, as an artist, it really is about putting yourself out there and I find that its best to just do what you love so whatever the feedback, I have had a blast, enjoyed the creative process, the meeting people, the close experience of theatre, the looking beyond and the digging deep – I feel satisfied with the outcome and am excited to see my pieces in situ. They will be there until mid October. 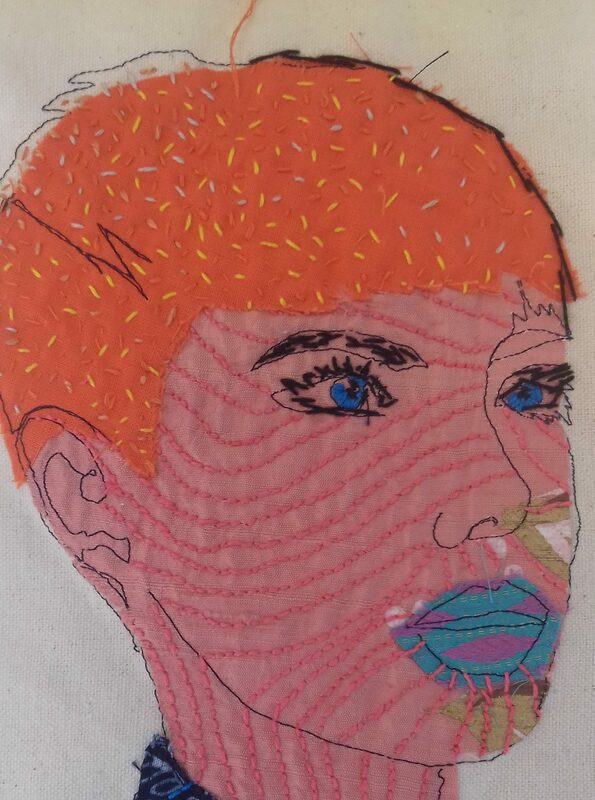 Over the summer I did another morning stitching at the theatre and went to see ‘The Meeting’ by Charlotte Jones -met her briefly at the directors talk for the play where audience members were encouraged to take part in my ‘Everyone is an Artist’ project. There will be piece to celebrate the outcome of this in the exhibition…I hope you managed a label…if not you could add to it when it is at the theatre from the 15th September. ‘The Meeting’ raised several issues……the role of pacifism when the nation is at war, outsider influence and how people cope with and react to disability. A play about language, silence and outsiders coming into the circle – I found it compelling, moving and thought provoking. I did a bit of stitching during the performance and through the interval to feel fully involved (!). The chairs from the production really spoke to me and I loved the way they were used in the play….and I am really lucky in being able to borrow them for a bit and use them in an art installation near you from the 15th September. It was tricky to decide what to do with them and how much to add and how much to leave them alone to tell their own story. The idea of the protagonist, an army deserter, coming in to disrupt the circle was the crux of the play, and he was welcomed in to the inner circle. I saw similarities in my coming into the theatre as an outsider, although, I hasten to add, I am not an army deserter nor have I been disruptive in quite the same way (but ( definately feel accepted by the circle.) However I do hope that I make people look at things from a different angle as that is what I see is my job as an artist! There were going to be screen prints too but I had a bit of a mishap with the screens…..the less said about that the better…moving swiftly on….they (the chairs) relate nicely to the wall pieces which I have stitched and printed using material printed with leaves collected from Oakland’s Park where the theatre stands, imagery drawn from the 2018 brochure and materials given to me by the lovely ladies in the wardrobe department. Wall pieces were taken to the framers last Friday and will be on display (and on sale – ever hopeful!) at the theatre next week. Life atthe moment seems to be treating me torahter a lot of incidents at the mo and my trip to the framers was an interesting foray in itself… what started out as an excellent concise meeting of minds turned into a two hour ordeal when my 10 year old managed to lock my car keys in the car!!! Don’t ask!!! Ah the joys of multi-tasking… thanks go to the mad Canadian who came to my rescue!!!! However every cloud -which is totally my motto in life – if we hadn’t been stranded I wouldn’t have wandered in the studio of the very talented artist Nicola Hancock who also develops and manages the Chichester Art Trail. I really got a lot from my unintentional visit and it wasn’t just the tea, shelter and my 10 year old occupied terrorizing her lovely dog! I felt inspired looking at Nicola’s eclectic mix of work. It really was beautiful, interesting and drew me in. Can’t wait to get my pictures back…and get on with making more diverse work myself. My research resulted in the production of a medal in memory of him and a heart in memory of his sweetheart, my future Grandma Abigail – whom I never met as she died before I was born. He was 19 when he signed up to go to France. Hard to contemplate what he must have endured and what all those young men and women must have gone through. Although it is important to celebrate and commemorate it is also really important to acknowledge the futileness and awful devastation of war. I think it will be a thought provoking exhibition and am proud to be a small part of it. EG stuff in the bag I schlepped around galleries in London including the Saatchi…lovely….and Frida Kahlo at V and A. Amazing. However I didn’t really like looking at all her personal stuff… it felt wrong, a bit voyeuristic to be looking at all her private things. I loved her paintings and her wardrobe …inspiring. Perhaps it would have been different if I’d seen them at the Blue House – because I really enjoyed snooping around Agatha Christie’s summer abode, Greenaway, in the summer. May be it is all about place? Or maybe I just fancy a trip to Mexico next? I also managed to squeeze in an exhibition an Ox Market Gallery in August with my fellow MA students. Great experience with some great feedback. Thank you to everyone who supported us…. So……..you’re not supposed to start a sentence with ‘so’ you know ‘cos it’s not grammatically correct. Did you know that? When you know, you realize how much it is done…or maybe its just me? Something to think about….anyway… there will be three parts to my final exhibition…did I tell you I do like working in threes…? Yes indeed – like a triptych, with a difference. A screen, some chairs and a series of framed wall hung works…… installed in the Foyer of the Festival Theatre from the 15th September….just in case I haven’t said that enough! And so dear reader my time at the theatre is nearly over…I really am lost for words – which is why I am an artist and let my work do the talking for me. The immersive experience has been inspiring and interesting for my artistic development and has taken me down a different path… on this occasion responding to the cft environment and its people and interpreting this institution at a particular moment in time. A huge thank you to everyone who has supported me in my time there, especially Jess and Richard and Charlotte, I will quite miss being there….I will however definitely be visiting the theatre more often in future!!! I really want to see Copenhagen and Flowers for Mrs Harris. Ever onwards….my next exhibition will be at the Otter Gallery in October and once the Chichester Festival Theatre work is hung I will be concentrating on that. This will sadly be the last exhibition at the Otter Gallery as it will close its doors and metamorphosise into a computer suite…ahh the onward march of technology….marvelous…. we artists need to keep on fighting to get art out there and claim spaces. Next I’m off on a research trip to India to explore the textiles of Gujarat…. I’ve managed to squeeze in a quick trip to the Tahj Mahal on the way home too……well when in Rome….or should I say Agra…. PS Sarah – Hope Edinburgh exhibiton goes well..the pics look fab!! wish i could have come with!